Interview questions for nanny jobs should include those questions that explore the competencies or behaviors essential for a good nanny. It is crucial for employers to find out whether the nanny they are hiring has the right abilities, knowledge and attitude to meet their requirements for the job. These behavioral interview questions for nanny require job applicants to provide a specific example of how they have previously demonstrated the desired competency or behavior. This provides valid evidence of their ability to do the job. In your behavioral interview answer describe the situation, the actions you took and the result or outcome. This is known as the STAR method. Tell me about the last family you worked for. How did you have to adjust your approach to meet their needs. This question is exploring the ability to adapt to different environments and people. As a nanny you are expected to form a bond with a variety of people who are different to your own background and experience. Your example should demonstrate your ability to be comfortable with different people and children, with new rules and ways of doing things and with a new environment. It is all about been sensitive to differences and working out the best approach. Describe a situation in which you had to deal with several different demands at once. How did you do this? 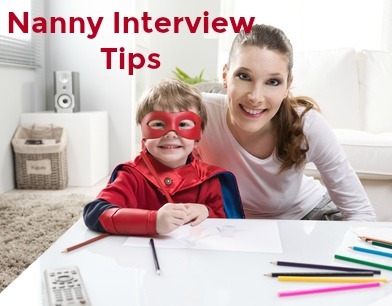 Your ability to multitask is under the spotlight with these type of interview questions for nanny. Most nannies are required to look after more than one child which means a number of things happening at the same time. Your example should show your ability to handle many things happening at once- cooking, supervising homework, feeding younger children and so on. Tell me about a situation when you had to handle a bad temper tantrum in your previous nanny job. Emotional maturity and the ability to manage a challenge while staying calm is an important competency for a nanny. A nanny needs to be able to control her own reactions while dealing with a difficult child. Your example should show the steps you took to defuse the situation. Tell me about a situation in which you had to discipline the children in your care. This is all about your ability to communicate with the child. The key aspects are your ability to deal immediately with a problem in a calm and controlled manner. Your ability to clearly communicate to the child why the child's behavior is a problem, to explain your expectations of the child's behavior as well as coming to an agreement with the child about future behavior are all important. Can you tell me about an emergency situation you have had to handle in your previous position? Can you tell me about an immediate, important decision you had to take in your previous position? The employer is exploring your ability to use your judgment and take action. Show how you are able to use the information you have to make the best decision. When a nanny is in charge she sometimes needs to make quick decisions and take quick action. Using your common sense and all the resources you have at hand are important. How have you handled an uncooperative child previously? Provide an example that show your ability to use the appropriate interpersonal skills to ask for help and to encourage involvement. Show how you provide positive feedback to gain cooperation rather than becoming stressed and threatening. How do you make sure that you remember all the details and instructions that go with child care? Your ability to listen carefully to directions and follow through with them is important as a nanny - your job is to deal with the children the way the parents see as best. You have to remember all the important details that the parents tell you about their children and their activities etc. Writing details down in a notebook, drawing up schedules and keeping a routine going are all effective ways of doing this. The complete guide to answering behavioral interview questions.